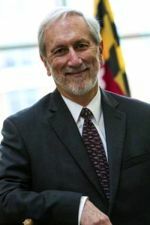 A 1971 graduate of the Ph.D. program at the Virginia Institute of Marine Science, Don Boesch is President of the University of Maryland Center for Environmental Science, Vice Chancellor of the University System for Environmental Sustainability, and a well-respected biological oceanographer. Immediately following the receipt of his doctorate, Boesch received a Fulbright Postdoctoral Fellowship at the University of Queensland in Australia. After the completion of his post-doc, Boesch returned to VIMS where he served on the faculty for eight years. That was until the creation of the Louisiana Universities Marine Consortium—an entity created to house the marine labs for all of the universities in the state. Subsequently, Boesch left VIMS and returned to his native New Orleans to fill the roll as LUMCON’s first Executive Director. Boesch became the President of UMCES in 1990 and has secured his spot as the longest-serving President they have had to date. In 2010, Boesch was appointed by President Obama to the National Commission on the BP Deepwater Horizon Oil Spill and Offshore Drilling, tasked with providing recommendations on how the United States could prevent and mitigate the impact of any future spills that result from offshore drilling.